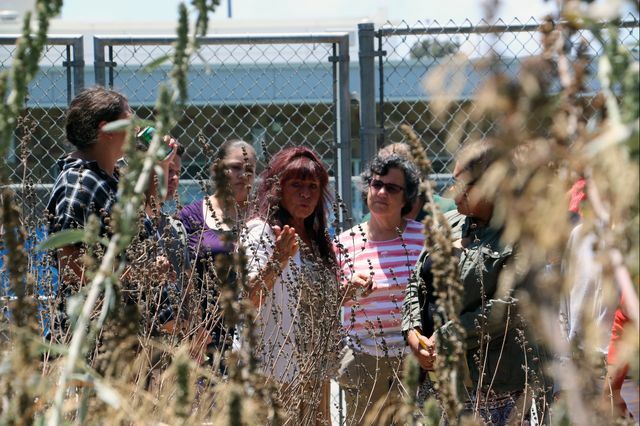 Tongva educator Barbara Drake teaches a group at Kuruvungna Springs about the Tongva’s engagement with the natural world. The site is enclosed on three sides by University High School. 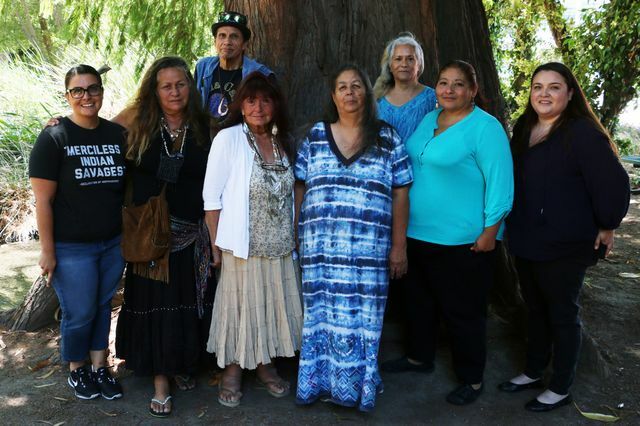 The participants in the “Teaching the Tongva” conference want to reframe the history of the indigenous peoples of California. The workshop is a component of Mapping Indigenous Los Angeles, an educational website whose content is created in collaboration with youth, community leaders and elders from indigenous communities throughout the county. The project’s ongoing researchers and creators are UCLA scholars and researchers Mishuana Goeman, Maylei Blackwell, Keith Camacho and Wendy Teeter. “There are indigenous identities that are deeply embedded in the history of Los Angeles. 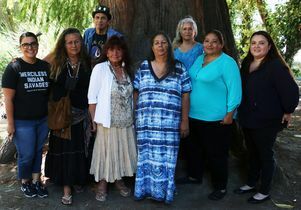 We want to make them visible by giving them a platform,” said Mishuana Goeman, associate professor of gender studies and incoming chair of the American Indian studies interdepartmental program at UCLA. 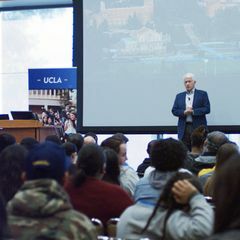 UCLA bears a unique opportunity to shepherd curriculum about the Tongva, by virtue of the campus being situated on land that once belonged to the tribe, said Blackwell, professor in the UCLA César E. Chávez Department of Chicana and Chicano Studies. The workshop was held at Kuruvungna Springs or “a place we stop in the sun,” just two miles southwest of UCLA. This is a sacred site for the Tongva — one that that is now nearly engulfed by University High School. 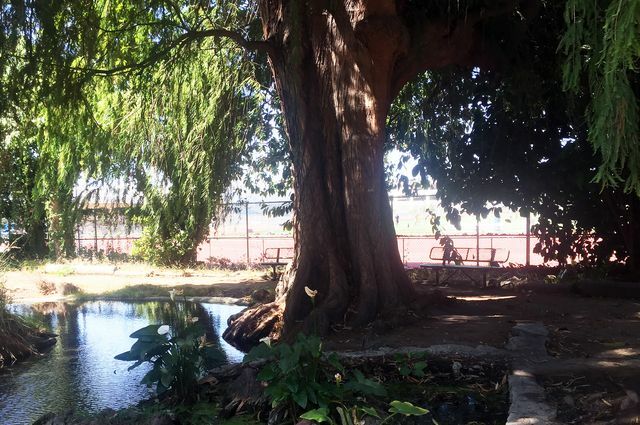 A majestic 150-year-old Mexican Cypress that stands beside a tranquil spring fringed by foliage and dotted by dragonflies now watches over a small cultural center that houses information and artifacts related to the Tongva. Mapping Indigenous Los Angeles creators and members of the Tongva community want to foster an ongoing engagement. Their goals are to develop lesson plans and direct teachers toward accurate sources of information about the indigenous history of Los Angeles and California. Their immediate plan is to use feedback and information from last week’s conference to create a list of resources, teaching materials and tools that will help educators self-assess the veracity of information related to indigenous people. All of these resources will be available to teachers on the Mapping Indigenous Los Angeles website. 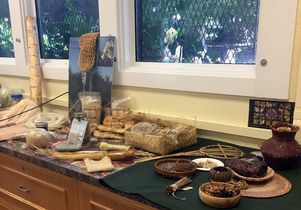 At the “Teaching the Tongva,” educator Craig Torres encourages educators to seek out and incorporate the natural materials that were used by the Tongva people in their history lessons. Teeter, who is curator of archaeology for the Fowler Museum at UCLA, teaches in the American Indian studies program. She has long been an advocate for the Tongva and her efforts in the community were critical in both the development of the Mapping Indigenous Los Angeles project as well as bringing together UCLA and Tongva educators for the first time. “It’s something we have envisioned for years, and marks a very important and historic step forward in indigenous education,” Teeter said. Tongva educator Craig Torres, who was instrumental in creating the Gabrelino-Tongva map found on the Mapping Indigenous L.A. website, was at the conference to encourage educators to seek out and incorporate natural materials that were used by the Tongva people into classroom projects, like white sage and yucca fiber, which served ceremonial and medicinal purposes for the Tongva, and still can be used for those purposes today. Torres in particular uses Tongva education to encourage students to think of their own relationships to the environment and a sustainable future by considering the “three Rs” — reduce, reuse, recycle — from the perspective of the Tongva and their ancient craft-making, artwork, tool-making and medicinal practices. Tongva educator Barbara Drake recommended books containing important contextual information about her people. She suggested that Tongva experiences and expertise could be incorporated into lessons around astronomy or architecture. 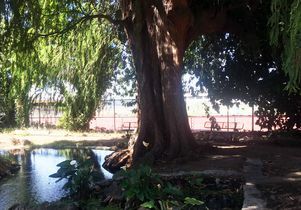 A 150-year-old Mexican Cypress at Kuruvungna Springs in West Los Angeles. 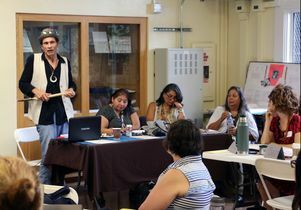 It’s especially timely to focus on curriculum related to Los Angeles’ indigenous people because as of last year the state changed recommendations around the long-running “Mission Project,” which is taught in fourth grade, said Emma Hipolito co-director of the UCLA History-Geography Project. For decades, students created models of a selected California mission out of craft materials or sugar cubes to illustrate the role Catholic settlers and missions played in both converting and subjugating the native population of California. 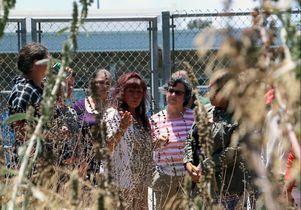 But indigenous educators say this is a problematic, if not offensive, manner of teaching California Indian culture and history, because it ignores the architectural innovation, craftsmanship, engineering and agricultural practices of the Tongva and other California tribes that flourished long before the Spanish colonized California and built the missions. 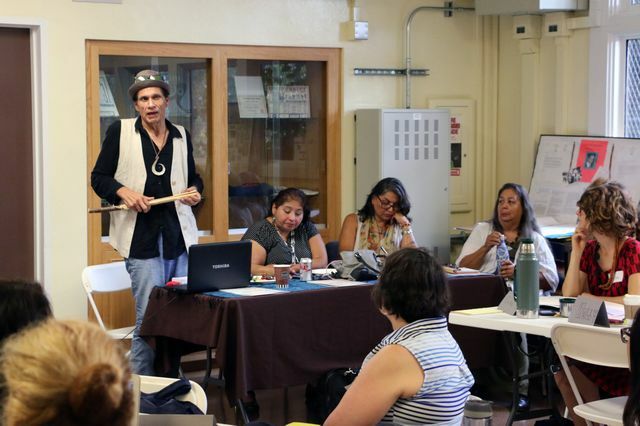 This history deserves to be explored and celebrated in and of itself, not just in relation to the missions, Tongva educators and UCLA scholars insist. Craig Torres teaches about Tongva history. A display of tools and materials created and used by the Tongva indians.